New cover and re-edit for book 4, Revenge. A long time ago I re-edited the first three books in the series, but I stopped there. My writing style has solidified now over the course of seventeen books (so far), and as such I’m currently doing a re-edit on book 4, Revenge. I was also never really happy with the cover for it, because the background on it was horrible. I made a new cover for it this morning, and I’ll be re-doing the covers for books 2 and 5 as well at some point here as soon as I get book 4 re-edited and released. Book 16 (Transition) and book 17 (Travelers) have now both been published. Synopsis: Their patience is at an end. It’s been a long time coming, but they’ve finally had enough of dealing with the stupidity and corruption of the human race, and now it’s time for them to go. Synopsis: It was the year 2231 when they started coming through the portals. The Echnid soldiers devastated the Earth and eliminated nearly eighty percent of the population as they searched for resources they could steal and send back to their home dimension. The books are or will be available at all the usual websites, including here on the official site. I was interviewed again today on Wayne Clingman’s Blogtalk Radio show. In this interview, I talked about the series, eBook promotion, pricing and other things as well, including what I do when I’m not writing. 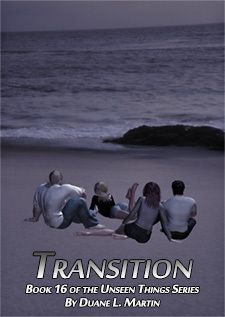 The first draft of book 16, Transition, is now complete! I just finished writing the first draft of Transition. Once I get it edited, I’ll publish both it and Travelers, book 17 of the series together at the same time. The editing usually takes me about five days, but it may take a bit longer because of some personal stuff I have going on at the moment. I’ll definitely have both books published at some point in the next two weeks though. I haven’t posted any updates here in a while, so I thought I’d pop in and let you all know how Transition is coming along. This morning I finished chapter 14, so I’ve got two more chapters to go in this one and then I can start editing. Two specific things have slowed down my writing as of late. The first is that we’ve had some friends of ours staying with us for about the past month, and both they and we have new border collie puppies, which means I’ve had to spend a lot of time watching them, taking them out to pee, etc…. See, I was sitting here writing, and I was almost done with chapter 14 when one of the puppies went under the desk and turned off the UPS my computer is connected to. Needless to say the computer died instantly, and I hadn’t saved yet since I’d started writing, so I lost it all. Then I spent the rest of the day pissed off about losing everything I’d written, so I had to walk away from it and get a good night’s sleep before I was able to come back to it again. Anyway, that’s what’s been going on. I haven’t been able to write anywhere near as much or as often as I normally do with all the craziness and distractions going on around here, but I am making it a point to at least write some every single day. 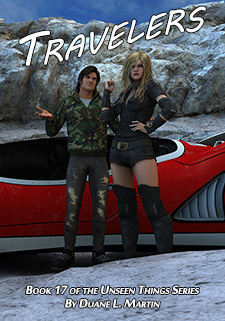 I’ve already got a perfect ending for this book that’ll tie in perfectly with the next one, Travelers, which will be released on the same day as Transition since it’s already written and edited. After that, I’ve got definite plans for two more books, and then we’ll see where things go from there. I’m thinking that after two more I’ll either end the series, or put out one more book of short stories as a companion to the series. We’ll just have to see how things go. Anyway, that’s it for now. I’ll try to be better about posting more frequent updates in the future.